Xela Bosque, Guatemala – Maya Hun Cuz is a 34 years old returned missionary, who is married with 2 children. She lives San Mateo, Quetzaltenango. She is an entrepreneur. She started a business of selling ice cream and bananas covered with chocolate. Her products are display in a refrigerator in her home. She gradually introduced smoothies and snacks for sale. She attended the Workshop on Self-Employment and then the Business Improvement Workshop. She learned that to achieve self-reliance, she needed to save. She has learned to be consistent, responsible and committed to herself and her customers. 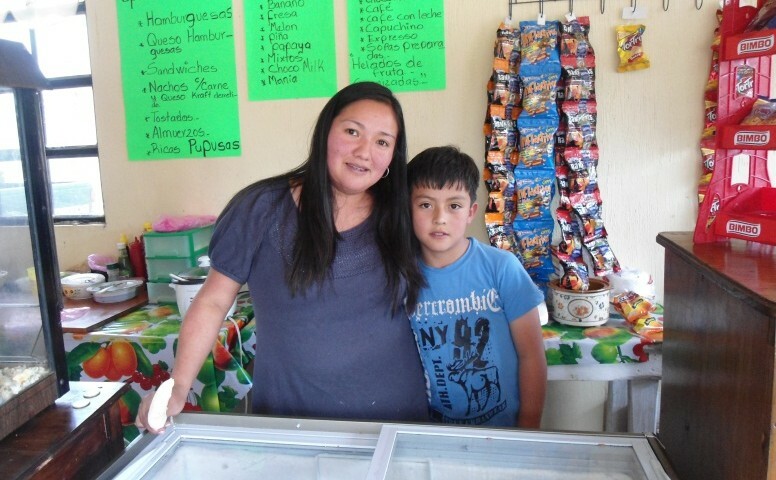 Her business savings have increased substantially, and she was able to buy a refrigerator and a freezer with her own savings. She has also introduced several popcorn and soft ice cream machines. Currently she uses a portion of her home to display her refreshment stand; she has added the sale of lunches and snacks for children’s events. Maya has learned to maintain accounting records. She is teaching her children that each family member must pay for what they consume from the business. This new habit in her family is helping to contribute in achieving self-reliance. She has increased her income by 149%.